Enjoy dinner and explore the ship on your first night on board as you sail. DISCOVERY Discover a very special family run hop garden where you will also taste a local beer. DISCOVERY Enjoy an onboard beer lecture hosted by your Beer Expert while cruising. DISCOVERY Enjoy an onboard beer tasting hosted by your Beer Expert. CLASSIC Join a Guided Walking Tour of a picturesque Main River Bavarian village. DISCOVERY This afternoon, join your Local Guide for a tour that will take you to discover the local beer flavors. DISCOVERY Based on your cruise date, you’ll be treated to either a Coffee Tasting or a Wine Tasting. DISCOVERY Tour the incredible Mechanical Music Museum for a one-of-a-kind instrumental experience. CLASSIC Join a City Tour of Strasbourg’s sights, including its gothic, stained-glass cathedral with its celebrated ancient murals and astronomical clock, as well as the magical La Petite France District. DISCOVERY Onboard food and beer pairing dinner by your Beer Expert. See the grandeur of Germany with a scenic river cruise through its most picturesque destinations along the Main and Rhine Rivers. Embark on your Avalon Suite Ship® in Nuremberg, and sail to Bamberg, the Franconian town where the myth of the good German beer is true, for a guided walking tour of the historic home to imperial dynas-ties. Your enchanting river cruise continues to Würzburg—the “Pearl of the Romantic Road.” From here sail to Frankfurt, where you can join a guided sightseeing tour of the city and discover more about local beers, or visit the nearby town of Seligenstadt. On your way to Rüdesheim enjoy a sailing through the picturesque views of the Romantic Rhine. Then cruise to Strasbourg and join a guided city tour of Strasbourg’s sights, such as the stunning stained-glass of its gothic cathe-dral, the astronomical clock, and La Petite France district. 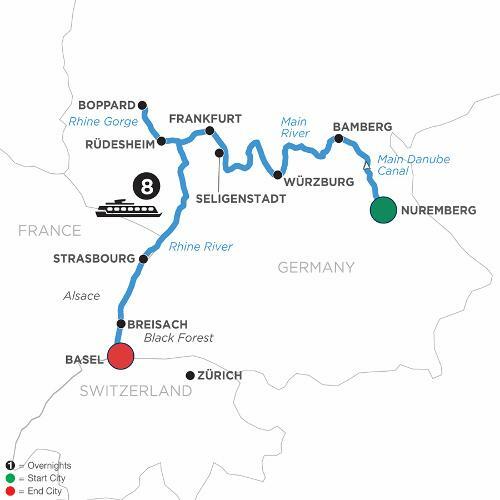 Your scenic cruise through Europe includes a stop in Breisach to visit Germany’s beautiful Black Forest region. Choose a visit to Badischer Winzerkeller, or a day trip to the Black Forest’s Vogtsbauernhof open-air museum, and more. A Beer Expert will travel with you on this cruise and will held lectures, tasting and will introduce you to food and beer pairing. Your grand German river cruise brings the beauty and charm of its cities and villages to life, and adds education and enjoyment with local beer and foods to savor along the way. From Bavaria to Switzerland and beyond, your German vacation will stay a beautiful memory for years to come! Gateway city for departures is Zürich.